SLB or SLX? or SOR? First of all, it's not SLB (SLBoutique) anymore. Their site was taken down a few weeks ago and was re-born as “Shop OnRez”. I am not sure I like the new name, but the new version seems to have a few interesting added features, such as bulk editing of entries. But first, a bit of background. I had started selling particles on SLX (SL Exchange) long before I had any land or shops of my own. In fact, SLX sales funded the purchase of my first land in Lanestris. I've been quite happy with SLX, although the sales are significantly lower than from my in-world store. Meanwhile, I also tried SLB. The management interface at first appears to be a lot slicker than SLX, but having used it to manage a large number of products, I'd have to say that the less-polished SLX was actually easier to use if you are a seller. Nevertheless, I set up a quantity of products on SLB and waited for sales. During the first month I made some sales, perhaps 25% of what I was receiving from SLX. However, after that sales dropped off to almost nothing – perhaps one sale every two months. Terrible! I had almost given up hope on SLB, but with the introduction of Shop.OnRez.com, I thought I should give it another try. After spending several hours setting up all my products on SLB (Whoops! I mean Shop.OnRez, of course! Or should I call it “SOR”?) I was satisfied that I did all I could to properly use SOR. Today, more than a month later, I signed into SOR and found to my surprise that I'd made 32 sales since I set up on the new SOR! I am liking this service more than the old one, at least for now. These sales are in fact somewhat larger than SLX during the same period. Good work, Sheep! I was reading SLInsider the other day, and ran across a post by Almathea Blanc about a new product. 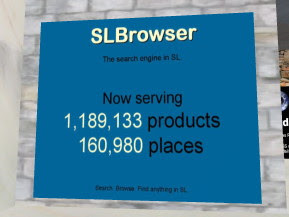 SLBrowser is a HUD that provides in-world searching for products, and it seems to work pretty well. Using design principles I admire (Less Is More), the creators of SLBrowser (Felix Wakmann and Diva Canto) have made a truly simple interface. Let's look at a simple example of a search. Say you want to find Bananas in SL. Just type “?bananas” in the chat window, and suddenly a list of banana-related items appears in your HUD. Then click on those entries to TP to the location. Simple! Best of all, it actually found my items, as opposed to the other search experiment by Electric Sheep Company. After playing with it for a while, I TP'd to SLBrowser HQ and provided some constructive feedback to the creators. Even better, we had a lively discussion with Ordinal Malaprop regarding the security and privacy considerations for the back-end of this service, which turn out to be quite complex and well beyond my capability of typing at this hour. Suffice to say that Felix and Diva are now anonymizing the data and considering an opt-out program. Good luck to Felix and Diva! If you want to get SLBrowser, go here. Enjoy! I visited the highly-touted Greenies sim the other day, and boy, is it impressive. I've seen a few “Land of the Giants” themed sims before, but Greenies is by far the best. It is massive and includes all the little details you'd expect to see in a conventional house – except that they are 20x larger than normal! The sim includes several rooms in what appears to be a small house, including a kitchen, table, living room, etc. The most interesting objects are items sitting on shelves, on the floor or located inside cabinets. It's totally crazy to see itsy-bitsy avatars crawling around car-sized ashtrays and enormous keyboards. Great fun! If you go, make sure you look everywhere and inside everything. I'd encourage you to spend time exploring Greenies, and don't be afraid to act like a mouse running across the floor to see everything! I wrote earlier about my philosophy on classifieds: keep the number of them low to focus your advertising dollars so that you will show up higher on the search results list. I'd like to amend that idea here, by introducing a new twist. While the original concept is still valid, it assumed there were only a fixed set of keywords that people would use to search for your products. As my inventory of for-sale products increases, I now find I have some items that don't really fit with my main classified ad. In other words, people would likely use different keywords to find those products. So, I realized that you could feasibly have more than one classified ad – as long as they each focus on a different set of keywords. Also, they each probably have different payments to get onto that all-important first or second search results page for the keywords they are designed around. In this way I believe I have optimized my classifieds by spending the least amount to get the maximum results. And it seems to work! I am getting somewhat more traffic lately. I read the now-infamous article in Wired this month that suggested RL companies have given up because they cannot seem to make any money in SL. The article cited a series of what I would consider bogus reasons for this, such as “empty sims”. Here are my thoughts on the situation. First, the article applies RL standards to a virtual world. It suggests that business success in SL is limited because of the apparent low population, and there is some truth to that, but not in the way the article implies. I don't think SL is a way to generate zillions, at least not yet. I believe this is because SL's current population (8M registered, 45K online) represents a market space and economy equivalent to a medium-sized city, not a national-sized audience. The SL market is essentially a small market, unlike Myspace or Facebook who have many millions of participants and is essentially an extension of the RL universe. SL operates more or less in a secondary virtual universe, whose connection to RL is very different from traditional websites who can easily address the needs of millions. SL Users are typically not in SL for RL purposes. They are in SL to create a NEW environment for themselves and their comrades. They make, use, wear and do things they cannot do in RL. Yes, there are some who do RL-related activities, but they are by far the minority. 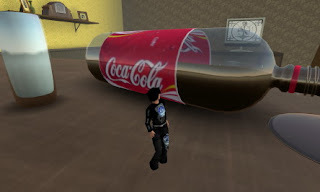 Most SL residents are there to create fantasies for themselves. This is why RL companies are having so much trouble – they are addressing the wrong universe! In such a small market, you must expect small returns until the economy grows. You cannot expect big things to happen. Consider an analogous situation: a big-city manufacturer shows up in 45,000 resident Smallville and spends $1M on a spanky new store. By the way, the big city manufacturer produces items that are not usable in Smallville. What do you think is going to happen? At this point in SL's history the successful commercial SL operations are those that directly address the residents' needs. These operations intimately understand the culture, habits and activities that take place in SL. They don't assume that success in some other universe will translate into SL success. They create new successes based on the characteristics of the secondary universe of SL. They fully engage SL and determine what the market needs – Like Any Successful Business Should Do!